Take a break from Bogota with a short trip to Salt Cathedral in Zipaquira, about 50 minutes away. There's lots more to do: see the interesting displays at Gold Museum (Museo del Oro), take your sightseeing to a higher altitude at Mount Monserrate, find something for the whole family at Divercity, and tour the pleasant surroundings at Parque Central Simon Bolivar. To find other places to visit, where to stay, more things to do, and tourist information, you can read our Bogota tour planner. Dublin, Ireland to Bogota is an approximately 19-hour flight. You'll gain 5 hours traveling from Dublin to Bogota due to the time zone difference. Traveling from Dublin in March, things will get somewhat warmer in Bogota: highs are around 22°C and lows about 11°C. Wrap up your sightseeing on the 3rd (Mon) early enough to travel to San Andres Island. 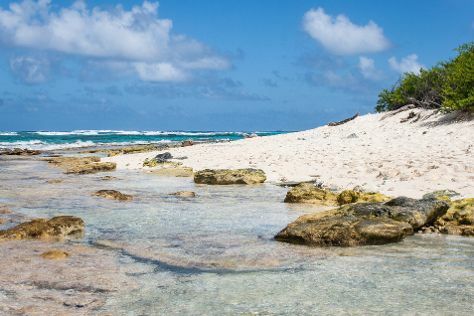 Kick off your visit on the 3rd (Mon): kick back and relax at Playa de San Luis, then pause for some serene contemplation at Primera Iglesia Bautista, and then head off the coast to Johnny Cay. Here are some ideas for day two: don't miss a visit to Rocky Cay, then look for all kinds of wild species at La Piscinita, then make a trip to Blow Hole, and finally see the interesting displays at Parque Tematico El Pueblito Isleno San Andres. To see more things to do, reviews, traveler tips, and tourist information, read San Andres Island tour planner. You can fly from Bogota to San Andres Island in 2.5 hours. When traveling from Bogota in April, plan for a bit warmer days and much warmer nights in San Andres Island: temperatures range from 35°C by day to 30°C at night. Finish up your sightseeing early on the 5th (Wed) so you can travel to Cartagena. Change things up with a short trip to Playa Blanca in Isla Baru (about 52 minutes away). And it doesn't end there: contemplate the long history of Walled City of Cartagena, take in the architecture and atmosphere at Sanctuary of Saint Peter Claver, admire the striking features of St. Catherine of Alexandria Cathedral, and don't miss a visit to Plaza Bolivar. To see more things to do, reviews, traveler tips, and more tourist information, you can read our Cartagena travel itinerary planner. Fly from San Andres Island to Cartagena in 2 hours. Expect a daytime high around 37°C in April, and nighttime lows around 30°C. Wrap up your sightseeing on the 7th (Fri) early enough to travel back home.